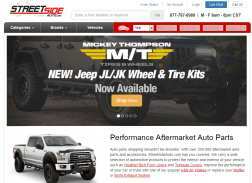 StreetSideAuto is an American retailer of branded performance parts and accessories for automobiles, trucks and jeeps. One of its sections is "Fuel Savers" i.e. products such as Air Filters, Cold Air Intakes and High Flow Mufflers that allows customers to get the most out of every tank of fuel. Customers recommend StreetSideAuto for its low prices and free shipping. Up to $35 Back When You Purchase Select Westin Step Bars & Running Boards. Free Ground Shipping on Most Orders Over $50. Some exclusions apply. 28% Off On VP Racing Round Fuel Jug. Save $20 on orders of $200 or more. Limited time only. Get $15 Off Any Order of $150 or More for a Limited Time. Plus free FedEx shipping on $100+. 10% off an order over $500. Limited time only. Get Free UPS Ground Shipping on all orders $100 or more. Excludes over-sized products. Take 5% off orders of $100. Limited time only. Get $100 off purchase of select DFS780 Diesel Fuel Systems from aFe Power.